IN THE PENAL COLONY, adapted from Franz Kafka's short story of the same name, investigates the performance of power, patriarchy and punishment. 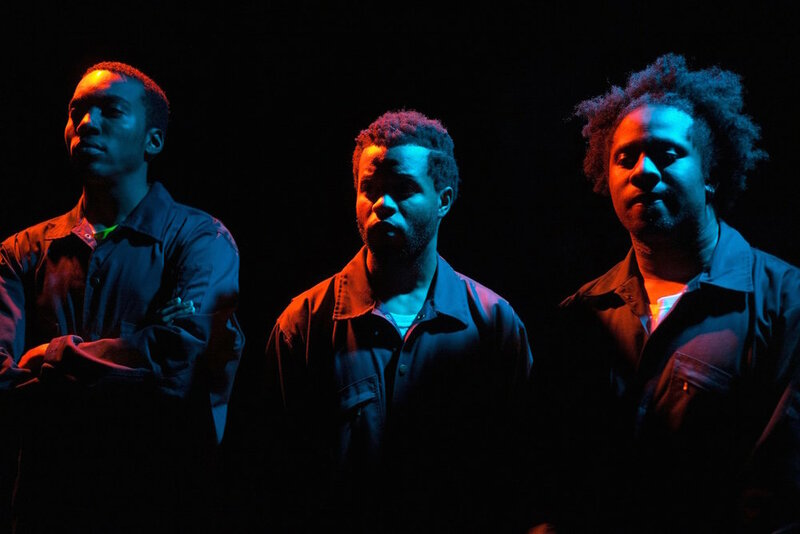 Three black men convene on an unnamed penal colony and challenge the presumptions of the worth of a human body, asking what does it mean for black male bodies to exist: in the media, when observed, when consumed, when punished. The shows on Saturday, September 8, and Thursday, September 13 will include a post-show talk back, cash wine & beer bar, and popcorn. Jamar Brathwaite (Performer) Jamar Brathwaite (The Officer) Credits: The Three Musketeers ( C.T.Hs 4 time Audelco Award Winning Production), Field Awakening (Signature Theater), Machinal (Columbia Stages), Aint Never Been Easy (Castillo), Manar (L.P.A.C). (Film): Man of Faith, No Compromise. Jamars a proud graduate of A.M.D.A. David Glover (Performer) David Glover is a poet, actor and director from Philadelphia. He is passionate about material that challenges biases, confronts power structures and asks big questions. His training spans many fields from serving in The US Army to a BA in Theater from Temple University. NY credits: Julius Caesar (Gallery Players), Ruined (Heights Players), Machinal (Columbia U), The Escape; or a leap for freedom (Columbia U), Vandals (The How), The Body Sung Electric (The How), The Roach (The How). Film: Print Shop. Next up: Vandals (The Tank). Dhari Noel (Performer) Dhari Noel is an actor and educator born and raised in Harlem. Recent productions include: The Essential Ella Maythorne (Dixon Hall), Telegraph Bois (Ars Nova), UnAmerican Activities (ECFS). He is also a regular participant of the annual Cherry Picking Festival as an actor, writer, and on the production team. After graduating in 2015 from Columbia University, Dhari became an Ethics and Performing Arts educator for middle school and high school age students. As a teacher, Dhari has worked on numerous productions serving as director (The Wiz) or co-director (The Wolves, Rhinoceros, UnAmerican Activities). He is passionate about telling stories that matter and creating experiences that are transformative. Tekla Monson (Set Designer) Tekla Monson is a designer for performance specializing in sets, props and costumes. Tekla was born and raised in Fairbanks, Alaska where she is the founding director of the Makers Lab @ TBK and has designed for Fairbanks Shakespeare Theater. Tekla graduated from Wesleyan University (CT). Recently she designed REFLUX at Broadway Bound Theater Festival and SOMETHING FOR THE FISH at Center for Performance Research. Zack Lobel (Lighting Design) is a video and lighting designer currently studying Film and Performance Design at Wesleyan University. Recent credits include work at the New Ohio Theater, Ars Nova, and the Broadway Bound Theatre Festival. Rose Beth Johnson-Brown (Associate Producer) Rose Beth Johnson-Brown is a director, producer, and journalist of theater and performance based in New York and Los Angeles. She has worked at The Under the Radar Festival at The Public, The Cherry Lane, Ground Floor at Berkeley Repertory Theater and will be starting at Showtime this Fall. Recent graduate of Wesleyan University.